LONDON (April 11): Emerging stocks slipped to three-week lows and were set for their longest losing streak of the year as tensions stemming from Syria and North Korea kept investors away from riskier assets, although Russia's rouble firmed off recent lows. MSCI's benchmark emerging stocks index fell 0.2% and was on track for its fourth session of losses, having sold off in the wake of the US attack on a Syrian air base and hardening attitudes towards North Korea. The White House said US President Donald Trump was open to authorising additional strikes on Syria and pressure is building on Russia to break its ties with Syrian President Bashar al-Assad. But Russian dollar-denominated stocks rebounded over 1% from three-week lows after a sharp sell-off in the aftermath of the US missile strike, while the Russian rouble firmed 0.5% against the US dollar, off two-week lows. Cristian Maggio, head of emerging markets strategy at TD Securities, said the rouble had been trading too strongly relative to oil prices ahead of the US strike on Syria, and this had triggered an overdue correction. "The rebound today is a rubber band effect," said Maggio. "The move from Trump in Syria put the US on a frontal crash course with Russian interests. Some of the optimism of the market in seeing a normalisation of international relations between Western countries and Russia has started to evaporate." Investors were also eyeing tensions in Asia. China and South Korea have agreed to impose tougher sanctions on North Korea if it carries out nuclear or long-range missile tests, as a US Navy strike group heads to the region in a show of force. South Korean assets bore the brunt of the regional selling with stocks down 0.4% to one-month lows in their sixth straight session in the red. The South Korean won also weakened 0.2% to three-week lows after falling more than 1% last week. Hong Kong shares fell 0.7%. 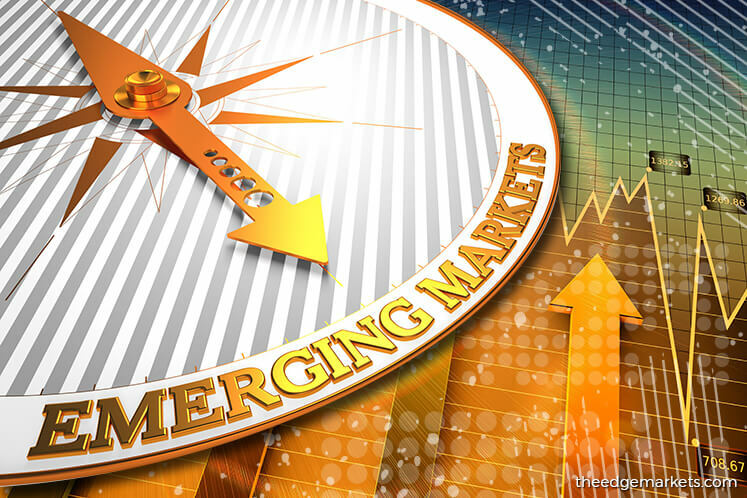 Yet some emerging currencies that have suffered in recent sessions steadied against the US dollar. The South African rand firmed 0.5%, off the three-month lows reached after the country's credit rating was downgraded by two ratings agencies to 'junk'. The central bank governor said it was too early to tell if the downgrades would push the economy into recession. The rand has weakened nearly 12% since March 27 when President Jacob Zuma recalled Finance Minister Pravin Gordhan from an investor roadshow, before sacking him. The Turkish lira firmed 0.2%, off near one-month lows hit on Friday, after its current account deficit narrowed to US$2.527 billion in February, more than forecast. Turkey's referendum on constitutional change will be held on April 16 but is thought unlikely to kickstart long stalled market reforms even if it passes. Maggio said he expected the yes vote to prevail by a small margin, which would be negative for the lira. If Turkey voted no, he expected the lira to strengthen. "But you may have another election or a retry of this referendum, and the political landscape will remain extremely polarised and contentious," he said. The Polish zloty weakened 0.2% and the Czech crown slipped 0.3% against the euro. Volatility gauges for both remain at multi-month highs, with traders taking out insurance bets ahead of France's upcoming election. In Serbia, central bank policy makers are expected to keep rates unchanged at 4%. In bond markets, Saudi Arabia set initial price guidance for its planned US dollar-denominated debut sukuk expected to be the biggest ever such issue, beating the US$4 billion that Qatar raised in 2012.